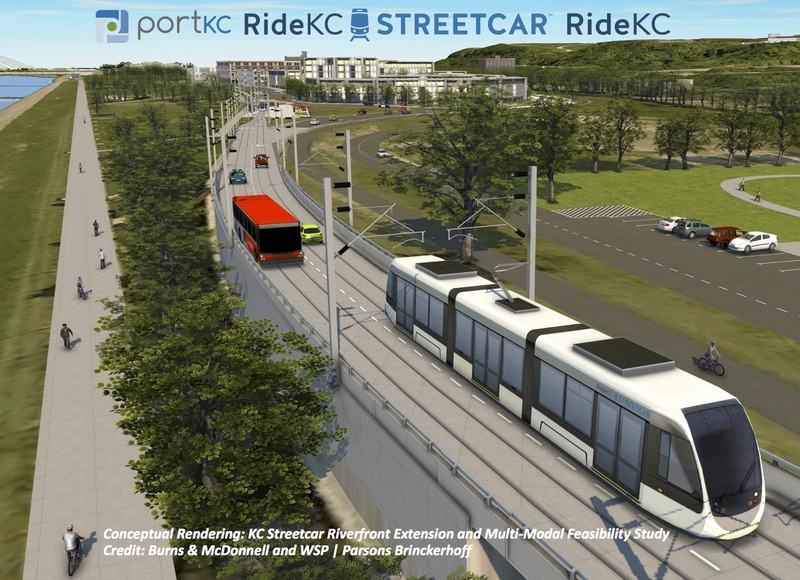 In October, the Kansas City Streetcar Authority, Port Authority, and KCATA issued a request for proposals to assess the feasibility of extending Kansas City’s streetcar to connect with Berkley Riverfront Park. The move should not surprise anyone. Kansas City’s streetcar has been wildly successful at overcoming precisely the two major challenges the riverfront faces. Kansas City’s streetcar is the great connector, pulling together Downtown’s scattered destinations with a convenient hop on the streetcar’s free and frequent service. The streetcar has also been a driver of economic development Downtown. Surface lots and vacant buildings are quickly disappearing along Main Street, and developers worth hundreds of millions of dollars in new development Downtown have cited the streetcar as a key reason for building here. Poor connectivity and slow investment are the clear barriers facing Kansas City’s waterfront, so exploring expansion of the streetcar seems like a smart move to immediately add value to the area and accelerate long delayed development. While there appears to be great value in connecting the riverfront through streetcar expansion, exactly how and where the streetcar connects will have long term consequences for a whole host of community priorities. The study of streetcar expansion to the riverfront should evaluate and understand these consequences, and think creatively about how the riverfront can be connected to best support community goals for redevelopment and an expanding streetcar system. A preliminary rendering for the study of streetcar expansion to the riverfront shows the streetcar using the Grand Viaduct to reach Berkley Riverfront Park. Based on the information provided in the request for proposals, including a technical memo and preliminary cost estimate, the current thinking is to connect streetcar to the riverfront via the existing Grand Viaduct. A more recent rendering by Burns and McDonnell, the firm selected to conduct the riverfront expansion study, also illustrates streetcar on the Grand Viaduct. In this scenario, an additional streetcar spur would be constructed from the streetcar loop at 3rd and Grand, extending approximately 3,235 feet along the viaduct, terminating near the western edge of Berkley Riverfront Park at the intersection of Front Street and Riverfront Drive. A preliminary report on the cost of streetcar expansion to the Riverfront identifies a Grand Viaduct alignment, and estimates of a total cost just under $30 million. 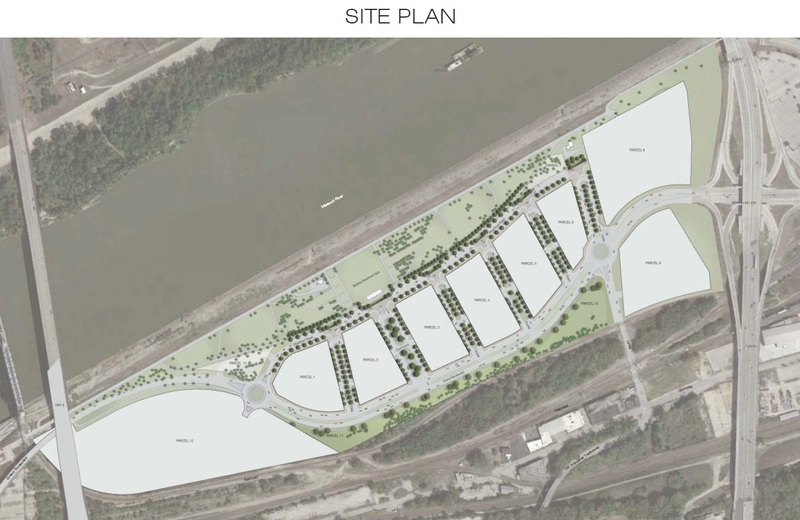 This potential alignment would successfully accomplish the near-term goal of connecting the riverfront, but it would also create some significant barriers to other long term goals. From the very beginning, the two mile streetcar route from the River Market to Union Station has been described as a starter line – the first step to a true streetcar network. Long before the starter line was operational, the NextRail and NorthRail studies examined in detail the potential expansion of the streetcar from a single line to a network of routes that provide high-frequency, high-quality fixed rail transit service throughout the urban core. The streetcar expansion planning work completed thus far includes study of numerous potential corridors and alignments from the perspectives of technical feasibility and community priority. Out of that work, four corridors emerged as priorities for future expansion. Two of those priority corridors, Independence Avenue and a Northland expansion across the Heart of America Bridge, are directly impacted by a potential riverfront streetcar expansion. The recommended route for streetcar on Independence Avenue extends east from 3rd and Grand to Cherry Street, where it turns south and continues east on Independence Avenue. The recommended route for a northern expansion across the Missouri River overlaps with the Independence Avenue alignment, extending east from 3rd and Grand before turning north across the Heart of America Bridge to North Kansas City. These proposed routes emerged as expansion priorities because of the connectivity, ridership, and economic development benefits they present, but they also have important operational benefits. One of the key advantages of streetcar expansion on Independence Avenue and north across the Heart of America Bridge is that these extensions can be seamlessly integrated in a continuous, single-seat ride through the entirety of the existing starter line. Each streetcar on Independence Avenue or Burlington Street can continue directly through the River Market to Downtown Kansas City, the Crossroads, Crown Center, and beyond. The NextRail study recommended streetcar expansion on Independence Avenue, connecting to the starter line via 3rd Street and Cherry Street. 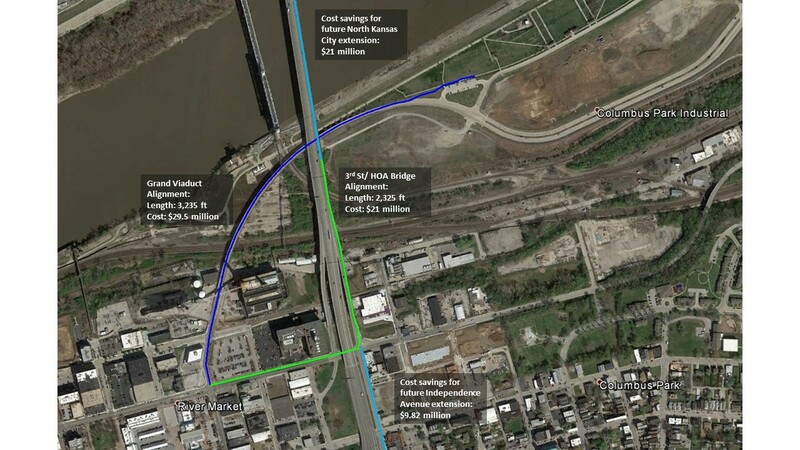 The NorthRail study recommended streetcar expansion across the Missouri River using the Heart of America Bridge to connect to Burlington in North Kansas City. This operational flexibility creates a better experience for riders, who do not have to switch trains to use the streetcar system. Riders also have the comfort of knowing that every streetcar connects to every stop through Downtown, and do not have to guess or research which streetcar to ride. 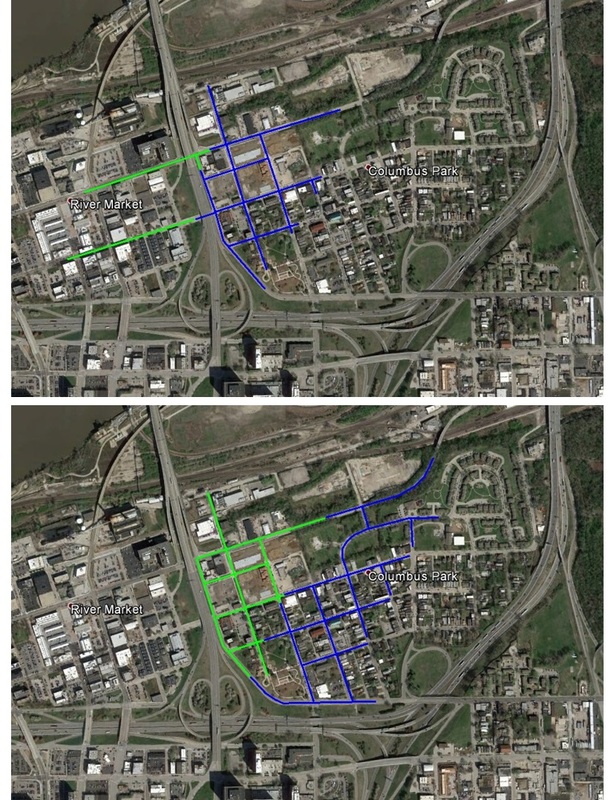 If the streetcar expands to both the Northland and Independence Avenue, these routes can layer to increase the frequency of service in the densest parts of Downtown, even for those who stay within the boundaries of the initial starter route. A streetcar extension to the Riverfront along the Grand Viaduct somewhat complicates these expansion opportunities. 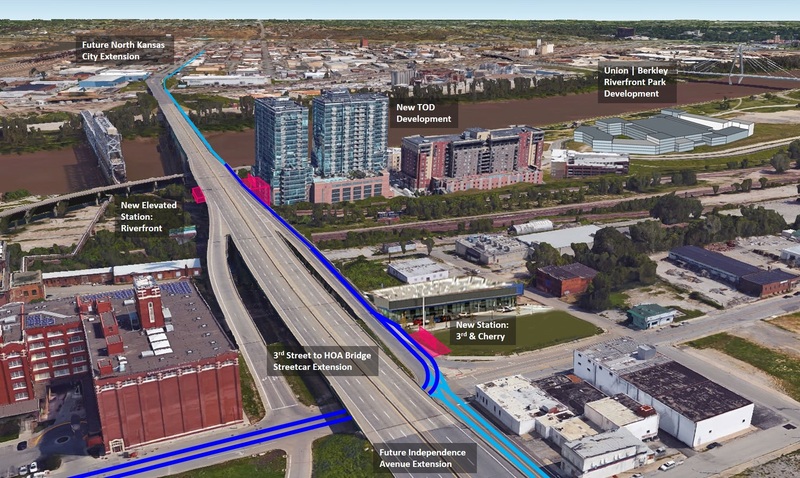 There is not a clear way to connect or continue a streetcar route on the Grand Viaduct or Berkley Riverfront Park to the prioritized corridors along Independence and Burlington. If an extension of the streetcar to the riverfront was the final and ultimate northern extent of the streetcar in the future, it could maintain a straightforward, linear, single-seat service for riders. If, however, the ultimate goal is further expansion to the north and east, a riverfront extension will always function as a sort of orphan spur, requiring its own dedicated service that cannot be integrated smoothly with a broader system. If a Grand Viaduct extension existed in parallel with routes to the north and east, then service would likely be degraded from an operational perspective. Likely, most streetcars would travel north or east along Burlington and Independence, while a much smaller number of streetcars would continue to the one or two stops along the riverfront spur. The streetcar system would be more complex to operate, less intuitive for riders, and perhaps most importantly, the quality and frequency of service to the riverfront would be limited. It would be impractical to maintain the same frequency of service to the riverfront that exists on the starter line today, and consequently the big picture benefits of investment in streetcar to the riverfront would also be constrained. The NextRail study examined the operational details of future streetcar expansion, including the opportunity for a single-seat ride with continuous service from UMKC through Downtown to the end of the Independence Avenue extension. In addition to the operational challenges a Grand Viaduct expansion creates for a future streetcar network, it also appears less efficient in terms of infrastructure cost for areas served. Streetcars are expensive. The cost estimate for a Grand Viaduct streetcar expansion to the riverfront includes a final tally of just under $30 million for a 3,235-foot extension. With future expansion across the Heart of America Bridge to North Kansas City, another 2,500 feet of track at a rough cost of $23 million will bring the streetcar to essentially the same spot on the riverfront. That’s a total of more than $50 million to run two streetcar tracks with redundant infrastructure to the same location. To compound the inefficiency, the economic return of streetcar on the Grand Viaduct is limited because it would run on an elevated viaduct over undevelopable property. 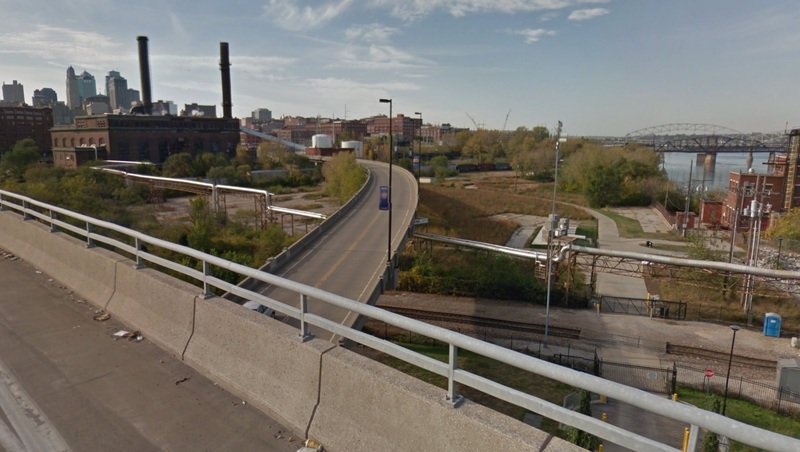 The elevated viaduct limits access in general, but in this specific location the adjacent property for much of the proposed riverfront expansion is open space, parkland, railroad, and other uses that cannot be redeveloped. The implementation challenge of extending streetcar for long distances in areas with limited taxable value and limited development potential was the largest barrier to expansion across the Missouri River identified in the NorthRail study, and it applies to a Grand Viaduct extension as well. The benefits of streetcar service on elevated structures are limited because the streetcar cannot connect or serve the areas it passes through. 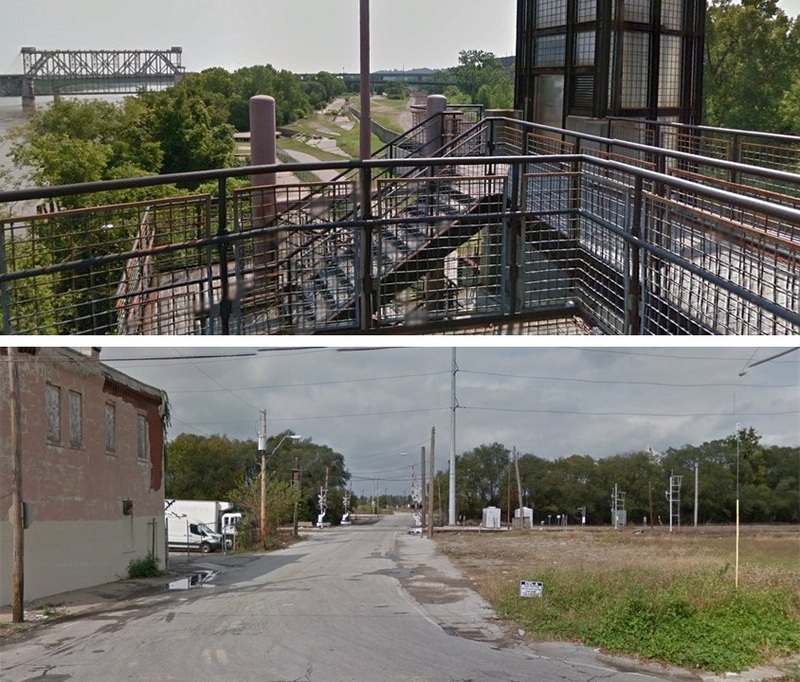 For the Grand Viaduct, undevelopable railroads and open spaces also limit long term opportunities to enhance and capture new property value along the route. Streetcar expansion to the riverfront is being explored in large part to address the connectivity barriers between the riverfront and the rest of Downtown. Today, it is not particularly easy to get to the riverfront for anyone not in a car (and even for drivers the options are limited). Railroads, highways, bridges, and other barriers separate the riverfront both physically and psychologically. The Town of Kansas Pedestrian Bridge connects to a trail that leads to Berkley Riverfront Park, but it is a ¾ mile trek to reach the western edge of the park. Cyclists must traverse a series of stairs or an elevator ride to access the trail. Access from the east is equally daunting. The only connection is via 3rd Street, following a long and circuitous path across railroads and industrial areas with no bicycle or pedestrian accommodations of any kind. There are no bicycle or pedestrian facilities on the Grand Viaduct today, but if there were the viaduct would easily provide the most direct and convenient connection between the River Market and riverfront area, with a short and direct path less than half the length of the existing trail (about 1/3 of a mile). There appears to be adequate space on the Grand Viaduct to incorporate bicycle and pedestrian improvements. With two lanes of traffic and approximately thirty feet of width, there is room for an eight to ten foot wide shared path for the entire length of the viaduct. Unfortunately, streetcar expansion on the Grand Viaduct likely precludes additional bicycle and pedestrian accommodations. Streetcar vehicles generally require a twelve-foot-wide travel lane. Two twelve-foot travel lanes on the viaduct would only leave four to six feet for pedestrians and cyclists – not enough space for a safe and comfortable shared zone. The thirty foot wide Grand Viaduct has room to accommodate streetcar service or a shared bicycle and pedestrian path, but probably not both. There is great potential in connecting streetcar to the riverfront, but there are particular challenges and shortcomings with a Grand Viaduct extension. A thoughtful and creative approach can deliver the connectivity and economic development benefits of a streetcar connection in a way that overcomes the challenges of the viaduct and directly supports a wide range of community priorities. The Grand Viaduct likely emerged as the default route to connect the riverfront because it appears to be the singular path with available infrastructure to actually carry a streetcar from the River Market, down the bluff, across the railroads, to an at-grade terminus near Berkley Riverfront Park. However, there are other ways to connect streetcar to the riverfront. One option is to extend a route east from 3rd and Grand to the Heart of America Bridge, turning north onto the bridge and providing access to the Riverfront from an elevated station. This station could provide access to the riverfront area below, and it could also be directly integrated into new transit-oriented development on one of the Port Authority’s largest (but today least accessible) development parcels. A streetcar extension along 3rd Street to the Heart of America Bridge could serve the riverfront from an elevated station. This alignment is shorter, less expensive, and better integrated with future expansion efforts than a Grand Viaduct alignment. It also provides unique opportunities to support transit-oriented development and improved bike/ped access. The feasibility of using the Heart of America Bridge was established through the NorthRail planning process, which also identified the eastern portion of the structure to locate the streetcar track. This scenario also works ideally for riverfront access. There are many examples of elevated stations for urban rail transit across the country that establish the viability of the concept for the Kansas City riverfront, including models for how to integrate streetcar service into adjacent transit-oriented development. The NorthRail study recommended using the Heart of America Bridge to get streetcar across the Missouri River. In this scenario, the bike/ped accommodation on the bridge is relocated to the west side of the structure. Streetcar costs depend on a variety of elements including track construction, vehicle purchases, site prep, and other related systems. The preliminary cost estimate for expansion along the Grand Viaduct outlines those cost elements in some detail. However, in general the factor that most directly relates to the cost of a streetcar extension is the length of the route. 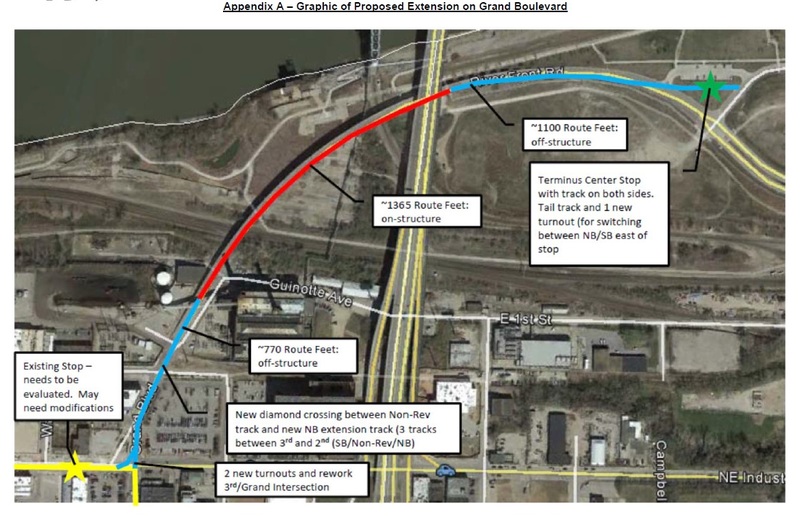 The proposed Grand Viaduct extension is approximately 3,235 feet with a cost of approximately $29.5 million. That averages to a cost of about $48 million per mile, which is in line with the per mile cost of the Downtown starter line. A riverfront streetcar alignment using Heart of America Bridge would be considerably shorter than a Grand Viaduct extension with a total length of approximately 2,325 feet. For a very rough estimate, assuming a similar cost per mile, this alignment would cost about $21 million. $8.5 million in savings is a lot of money – almost 30% of the total project cost. The savings and efficiency of a Heart of America Bridge streetcar alignment compounds when you consider potential future expansion. That’s because a Grand Viaduct streetcar alignment serves only the riverfront, while an alignment from 3rd street to the Heart of America Bridge also directly serves multiple future extensions. $21 million invested to connect to the riverfront is also $21 million to connect across the Missouri River to North Kansas City, and $10 million to connect to Independence Avenue. That’s a strategy that takes a future network far further for the same dollars. 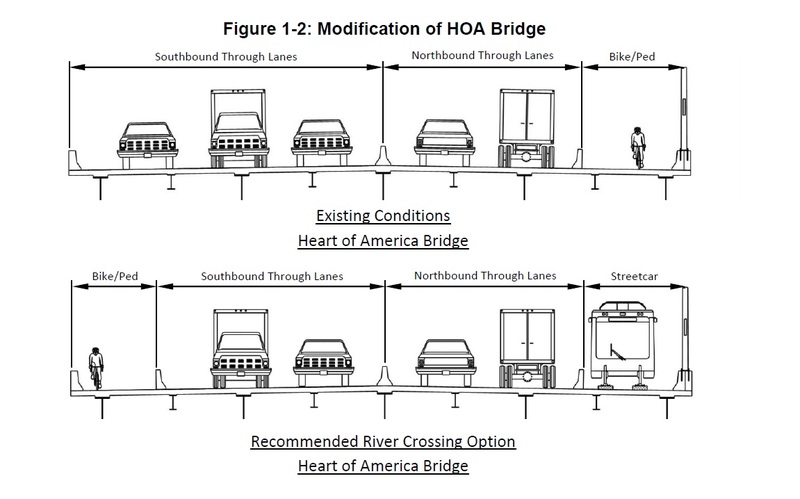 Because it is considerably shorter, a 3rd Street / HOA Bridge alignment would be much less expensive than a Grand Viaduct extension. Because it overlaps with two future expansion routes, the 3rd Street / HOA Bridge alignment cuts millions from the price tag of those expansions as well. An alignment from 3rd Street to Heart of America Bridge also directly alleviates some of the challenges of expansion for the North and East Kansas City routes. The Downtown starter route has demonstrated that the significant investment in streetcar infrastructure is balanced by the connectivity and economic development returns it can provide. However, for routes with long segments of track that travel through undevelopable areas, or travel in a way that access cannot be provided, these benefits are reduced. Implementation can also be more difficult because there is less value to create and less value to capture for project financing. An alignment that extends from 3rd Street to the Heart of America Bridge not only reduces the cost of future expansion, it increases the potential value that can be created through streetcar investment. The Grand Viaduct route travels on an elevated structure across undevelopable railroads and open space. By contrast, an alignment from 3rd Street to Heart of America Bridge would directly front numerous development sites in both the River Market and Columbus Park. Today, the Port Authority’s westernmost development parcel is just a few hundred feet away from new investment and development in the River Market and Columbus Park, but this site has limited access to both areas. Streetcar access to this development site from Heart of America Bridge would create a new front door for the parcel, increasing its development potential by increasing the functional access and proximity of the site to the rest of Downtown. With new streetcar, pedestrian, and bicycle access provided at the nearest, shortest distance to downtown, this parcel could benefit from new connectivity that has never been available for any modes of travel, and that would not be possible with a Grand Viaduct streetcar alignment. In the Port Authority’s Development Master Plan divides the riverfront area into several developable parcels. 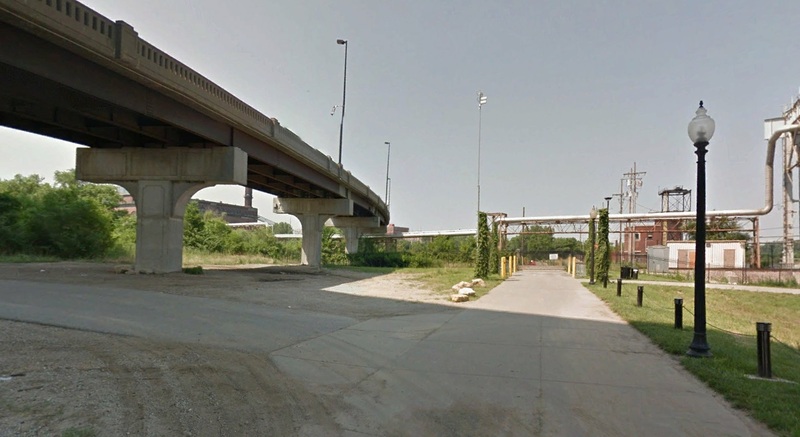 The development parcel adjacent to the Grand Viaduct and the Heart of America Bridge is the largest site on the riverfront, but also one of the least accessible. A walk down Main Street makes it clear just how much the streetcar is an organizing force for development. Even before the downtown starter line was operational, surface lots were disappearing, long vacant structures were renovated, and new development was popping up along the route. However, most investment along the route thus far has been more reactionary than strategic. Several new projects have been located to benefit from streetcar service, but not designed in a manner that takes best advantage of that infrastructure (pedestrian unfriendly frontages and parking podiums at Centropolis and 20th/Main are examples). Other City policy and investment decisions (from a languishing TOD policy to plans for thousands of new parking spaces in the River Market) appear to undermine the fullest potential of streetcar service. It doesn’t have to be that way. Across the country, there are great examples of true transit-oriented development partnerships where public infrastructure and private development are implemented seamlessly together. Detroit’s new streetcar is moving forward with tens of millions of dollars of funding by private and foundational partners, and is led by a largely non-governmental partnership. In Minneapolis/St. Paul, public and private partners are exploring an Innovation Financing Platform and clustering multiple shared infrastructure systems in the Prospect Park area to improve density and add more value while reducing negative environmental impacts and reducing risk to investors. In these cases, private investors were partners in financing the infrastructure, because they could directly capitalize on the value it was creating. They enhance the value of their investments by coordinating directly in the design and implementation of public improvements. With the riverfront development areas, perhaps more than anywhere else in the region, there is a unique opportunity for a true TOD partnership. Value for the development site is maximized by integrating streetcar directly into new TOD development. The functionality of the streetcar is maximized by designing and managing development around streetcar service. Such a partnership also enables Kansas City to think more creatively about project financing. There are important reasons that the TDD model was pursued to fund the starter line, but the TDD approach has definite limitations (contentious elections, most notably). 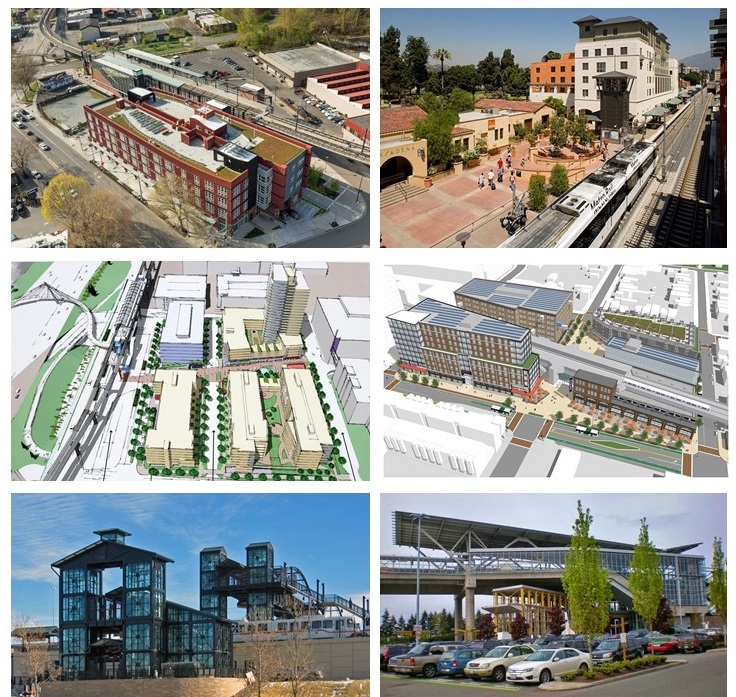 On the riverfront, with a carefully integrated TOD site, there is an opportunity to pursue a more innovative value capture strategy for the finance and operations of public infrastructure that enhances the value of the area far beyond what’s possible by mere proximity to streetcar service. There are good examples of elevated rail stations across the country, including sites where transit-oriented development has been strategically integrated with elevated rail infrastructure. Extending the streetcar down 3rd Street to Heart of America Bridge allows the extension to serve many more people in the near term than a Grand Viaduct extension. This is because in addition to connecting the Riverfront, an extension down 3rd Street can serve most residents of Columbus Park as well (with a station near 3rd and Cherry Street). A quarter mile walking distance is the sweet spot for streetcar use. Within that boundary, it is highly convenient to access the service, and usage is high. A smaller but still significant number of riders will walk up to one half mile to a streetcar stop. Today, nowhere in Columbus Park is within one quarter mile of the streetcar. The one half mile boundary extends just two blocks into the neighborhood. With a potential new streetcar stop at 3rd and Cherry, all of the new Columbus Park Lofts development, and many other vacant and underutilized parcels in the neighborhood fall within the one quarter mile walk distance. Most of the neighborhood (east all the way to Troost) would fall within the one half mile walk boundary. Overall, this represents a major increase in the availability and quality of streetcar service for one of Kansas City’s densest and most diverse urban neighborhoods. That’s a quite a benefit for an investment focused on serving the riverfront. One could argue that the number of residents, businesses, and development parcels served by providing access to Columbus Park with this short extension are at least on par with the those who would be served in new development around Berkley Park. An alignment from 3rd Street to the Heart of America Bridge can serve both. Top: Today, nowhere in Columbus Park is within a 1/4 mile walking distance to the streetcar (green lines). The Columbus Park Lofts development and adjacent blocks are within a 1/2 mile walking distance (blue lines). Bottom: With a future stop at 3rd and Cherry, large sections of new development and future development would be within 1/4 mile walking distance. Much of the neighborhood (east all the way past Troost) would fall within the 1/2 mile walking distance. Streetcar expansion on the Grand Viaduct would effectively close the door on bicycle and pedestrian access to the riverfront via Grand. The size and operational requirements of streetcar vehicles requires lane widths slightly wider than are necessary for regular automobile traffic. The existing Grand Viaduct has approximately thirty feet of width. With two twelve-foot-wide lanes to accommodate streetcar, the remaining space is too narrow to safely and comfortable accommodate shared bicycle and pedestrian activity on the viaduct. If the streetcar extension instead connects to the riverfront via the Heart of America Bridge, the existing viaduct could reasonably accommodate an 8-10 foot shared bicycle and pedestrian path, providing multi-modal access to the riverfront much more directly than is possible today. 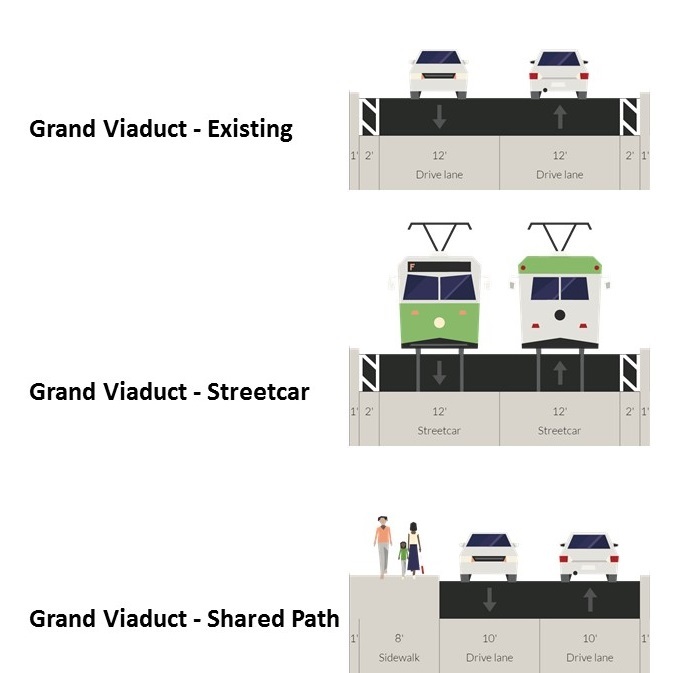 Because streetcar vehicles require wider travel lanes, streetcar expansion probably closes the door on Grand Viaduct bicycle and pedestrian facilities. Streetcar expansion to the riverfront via 3rd Street and Heart of America Bridge not only preserves opportunities for bicycle and pedestrian access on the Grand Viaduct, it also creates new bicycle and pedestrian connections to Columbus Park. Today, despite being the riverfront area’s closet neighbor, Columbus Park has no good way to directly access the riverfront. A roundabout connection along 3rd Street traverses several railroads and industrial sites with no sidewalks or bicycle facilities. Because a rail extension on Heart of America Bridge would provide new streetcar access to the Riverfront, it would also provide new bicycle and pedestrian access, making the walk or bike from Columbus Park to the riverfront shorter, safer, and more comfortable. A streetcar extension from 3rd Street to Heart of America Bridge does many good things. It costs less than a Grand Viaduct extension, and as a bonus reduces the cost of future expansions. It enables new access to the riverfront for multiple modes, and creates a unique opportunity for new transit-oriented development on a difficult site. It connects more existing residents and businesses in the River Market and Columbus Park, and increases the valuable developable frontage that the streetcar can enhance. Finally, it preserves the potential for bicycle and pedestrian access on the existing Grand Viaduct. With all of these opportunities to improve the riverfront and pre-position future expansions while minimizing project costs, a 3rd Street to Heart of America Bridge streetcar alignment should be a serious focus in the upcoming study for riverfront streetcar expansion.